What is the Stream Deck? 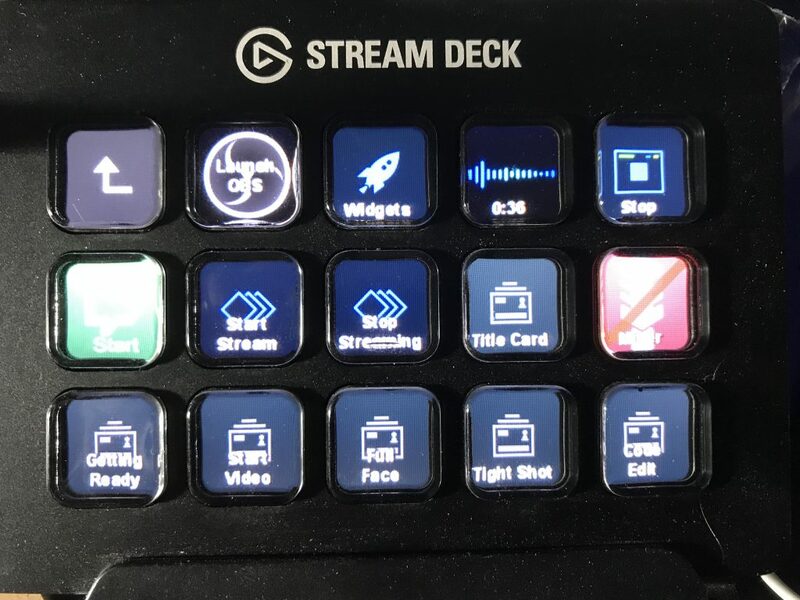 The Stream Deck is a small programmable external keyboard with LCD buttons that comes with an initial configuration to help live-video streamers run their shows without having to change applications, type, or move their mouse. The device communicates with an application that runs on Mac or Windows and automates interaction with Open Broadcaster Software (OBS), XSplit, plays sounds, launches applications, sends key strokes, and interacts with services like Twitter, Twitch, Mixer, and YouTube. For running my stream, its invaluable. I want to be able to focus on my chat room and writing code. When I need to change scenes, play music, activate or deactivate microphones, or drop in the goofy sound effect, I just don’t want to use my mouse to locate the right application and interact with it. 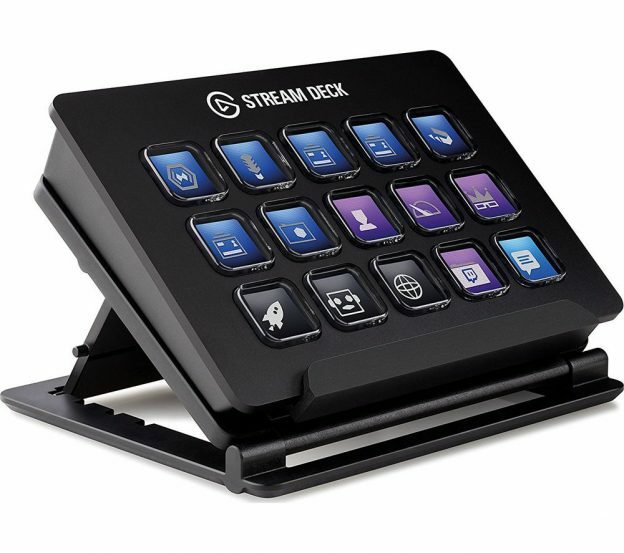 Let’s automate ALL of those repetitive tasks and wire them up to a Stream Deck button so that everything is a button-press away and I can stay focused on the stream. The top questions that I have been getting recently have been: How’d you do that so quickly? You changed your Twitter name and started your stream all at the same time, how does that work? Your stream looks so good, what is your secret. The answer too all of these questions is simple: I use the Stream Deck. Let’s take a look at some of the buttons that I have configured. The top right button shows the current CPU utilization of my PC, EXTREMELY handy when trying to determine why Visual Studio or OBS is misbehaving. The bottom row contains buttons to launch a browser and navigate to my GitHub page and my Twitch Dashboard. The bottom right button is a status indicator, showing me how many viewers I currently have on Twitch. 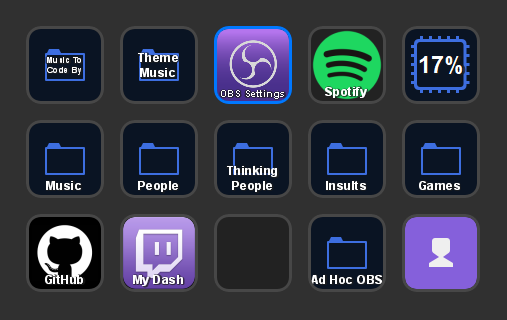 Let’s look at something more interesting, managing OBS from the Stream Deck. Top row, I have buttons that launch OBS and start my widgets that I host on screen. The widgets are an ASP.NET Core application that run inside of a Docker container on my local machine. 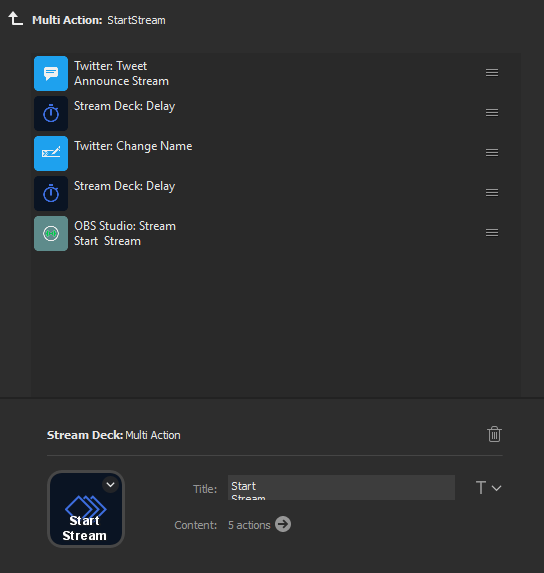 Both of these buttons launch applications using the standard Stream Deck “Open Application” action, with the widgets launching a batch file that configures and starts the container. I’m just recently started using Multi-Actions, and the automation here is amazing. This is one button, but can trigger the actions of any other button. Previously, I had these actions on other buttons… but now I no longer need that because I can send the Twitter message to announce my stream, change my profile name, and start the OBS stream all on one button. I added a 500ms delay between each step just to ensure that the automation completes properly and because I’m a little paranoid. The next button, “Stop Streaming” does just the opposite of this button, resetting my Twitter name and stopping the stream process from OBS. 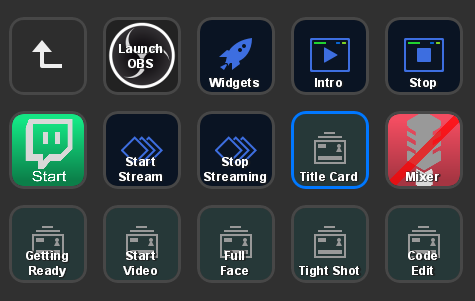 The next button is my ‘Title Card’ that you almost NEVER see on stream, and its a scene in OBS that just has the name of my show. 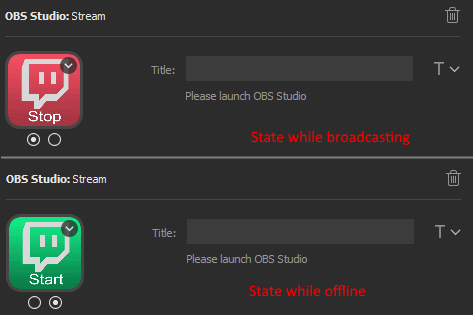 The button lights up when the OBS scene is active, and is dim (as seen in this image) when inactive. The final button on this row is a mute / unmute button for my sound mixer feed in OBS. Once again, I customized this button using the Stream Deck Key Creator application so that its really easy to see the state of my audio-output. Green when my microphone is hot, red when it is muted. I mute this whenever I am not streaming so that I do not accidentally have sound go out to Twitch. Hmm… maybe I should add that to my “Stop Streaming” multi-action. The bottom row are all scenes in OBS, allowing me to change the appearance of the video that I am presenting. Easy stuff… nothing impressive there. 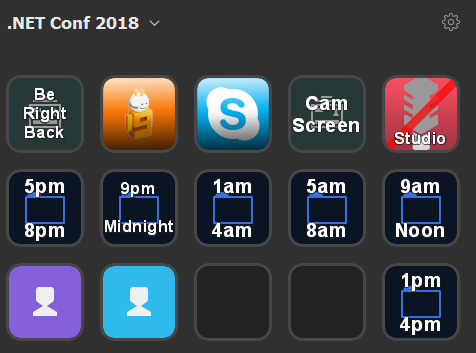 Running the Stream Deck with this configuration works for ME… what about setting it for a team of hosts, to run a non-stop event for 24 hours, who have never streamed before? 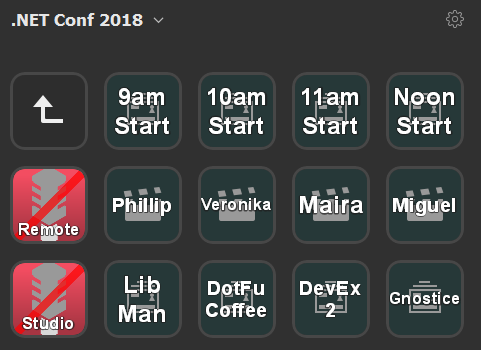 Oh yeah, I pulled it off… .NET Conf 2018 was produced and run from Microsoft’s Channel 9 Studio C for 24 hours straight, and the Stream Deck ran it ALL. We had 24 speakers present, configurations for each speaker to take over OBS with an intro video, camera configuration, nameplate, and a 5 minute commercial video. This is a LOT of content to juggle, and we made it work with a team of 8 hosts who all were trained to use a simplified Stream Deck configuration. Here’s how it worked: we had a rescue title slide on the top left button for “Be Right Back” in case there were any technical issues… and we had one or two during the marathon production. The next two buttons with the Channel 9 logo and the Skype logo were isolated camera shots from either the studio or the remote presented connected with Skype. The Cam-Screen button would allow us to have both cameras active so that you could have a conversation with both parties visible. The final button on the top is the audio mute for the in-studio microphones. Each of the buttons collections for an hour of presentation looked like the above. The leftmost buttons allow control of the remote guest’s microphone and the in-studio microphones. Each column of buttons was assigned to work together. At 10am, we pushed the 10am Start button that played an intro video scene in OBS and automatically transitioned to the Skype feed with Veronika’s nameplate showing. 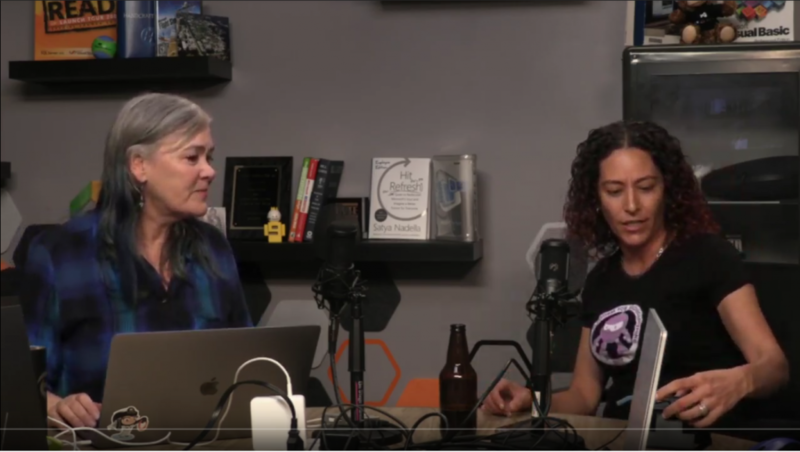 We would chat with Veronika to introduce her then mute the in-studio microphone and hide her nameplate by pushing the middle button with her name on it. Finally, when the hour was up we would turn the in-studio microphone back on, thank the speaker and cue the 5 minute bumper video on the bottom row. It worked beautifully, and the hosts really enjoyed working with the device, as it made their job of switching and organizing the guests MUCH easier.